John S. McCain, III, was born to Admiral John S. McCain, Jr. (1911-1981), and Roberta Wright McCain (1912- ), on August 29, 1936, at Coco Solo Naval Air Station in the Panama Canal Zone of Panama. He was also the grandson of Admiral John S. McCain, Sr. (1884-1945). McCain was commissioned through the U.S. Naval Academy on June 4, 1958, and he completed flight training and was designated a Naval Aviator in May 1960. After flight training in the A-1 Skyraider, McCain joined Attack Squadron 65, where he served from November 1960 to October 1963, including standing alert duty during the Cuban Missile Crisis. He next served as a Flight Instructor from November 1963 to October 1966. From October 1966 to April 1967, LCDR McCain transitioned into the A-4 Skyhawk with Attack Squadron 44 at Cecil Field, Florida. He joined Attack Squadron 46 in May 1967, and was almost killed on board the USS Forrestal when it had a major fire on the flight deck on July 29, 1967. He transferred to Attack Squadron 163 in October 1967, and was forced to eject over North Vietnam on October 26, 1967. McCain was immediately captured and taken as a Prisoner of War. After spending the next 1,966 days in captivity, he was released during Operation Homecoming on March 14, 1973. After hospitalization, McCain attended the National War College at Fort McNair in Washington, D.C., from July 1973 to June 1974. His next assignment was as Commanding Officer of VA-174 from August 1974 to July 1977. He then served as the Navy's liaison to the U.S. Senate from July 1977 until his retirement from the Navy on April 1, 1981. 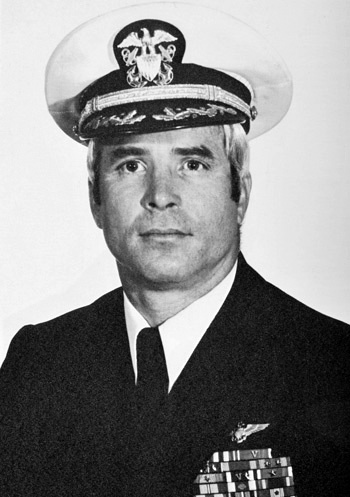 After his retirement from the Navy, McCain was elected to the U.S. House of Representatives from Arizona's 1st District and served from January 1983 to January 1987. He was next elected to the U.S. Senate from Arizona and has served in that office since January 1987. He ran for President of the United States in the 2000 and 2008 Presidential Elections. John married Cindy Lou Hensley of Phoenix, Arizona, on May 17, 1980, and they have 4 children-Meghan, John Sidney IV, James, and Bridget. John McCain died on August 25, 2018, and was buried at the U.S. Naval Academy Cemetery in Annapolis, Maryland. 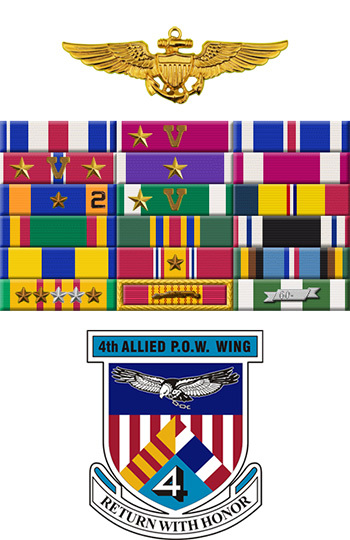 For conspicuous gallantry and intrepidity while interned as a Prisoner of War in North Vietnam from 27 October to 8 December 1967. His captors, completely ignoring international agreements, subjected him to extreme mental and physical cruelties in an attempt to obtain military information and false confessions for propaganda purposes. Through his resistance to those brutalities, he contributed significantly toward the eventual abandonment of harsh treatment by the North Vietnamese, which was attracting international attention. By his determination, courage, resourcefulness, and devotion to duty, he reflected great credit upon himself and upheld the highest traditions of the Naval Service and the United States Armed Forces.